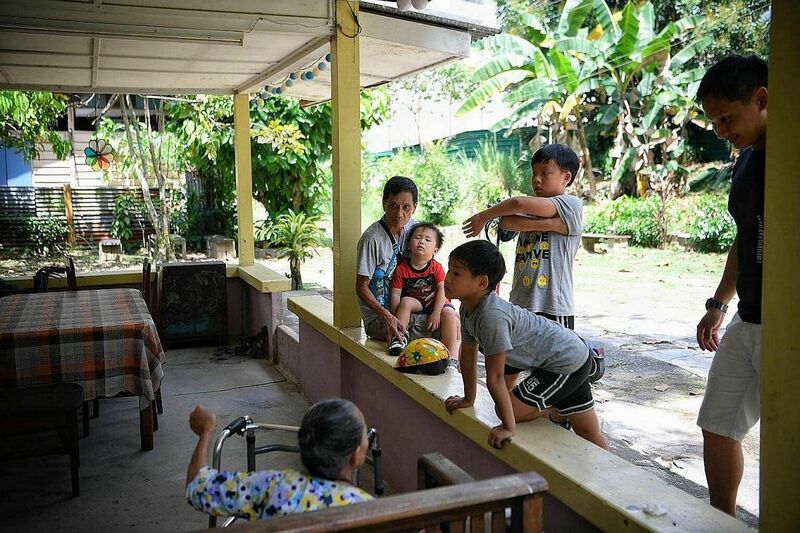 As the end looms for Singapore's last kampung, journalist Ng Huiwen charts a day of the throwback lifestyle - from leaky roofs to sharing food with neighbours - of the 26 families who remain there. Before the first rays of sunlight strike Kampung Lorong Buangkok, Mr Ter Ah Seng is already out on the front porch of his zinc-roofed, wooden house, stretching his aching muscles. It is 6.30am on Friday and the 78-year-old retiree is up slightly earlier than usual because of a bad cough. His neighbour's roosters give several hearty squawks and several birds chime in, but Mr Ter does not seem to notice the countryside cacophony. After all, he has been living in Lorong Buangkok - Singapore's last surviving kampung on the mainland - with his family for about 50 years. Today, his wife and only daughter, who is in her late 40s, continue to live with him there. "It is part of kampung life. I just like getting up early because the air is fresh, and I will cycle out to have breakfast or meet my friends," he says in Mandarin. He uses a rag to wipe down his 20-year-old bicycle, recently given a new coat of sleek black paint, before hopping on and pedalling down the gravelly path. Soon after, more residents stir from their sleep. Some head to their spartan kitchens to prepare breakfast, while others busy themselves with simple chores. A loud clang from the nearby construction site sounds across the kampung, signalling that work has begun. Several new Build-To-Order blocks of flats have risen at the sprawling worksite, which hugs the fringes of the kampung. As the sound of drilling and knocking hum in the background, 64-year-old Aton, who goes by only one name, sweeps her doorstep with a traditional straw broom. She takes the Berita Harian newspaper in, before sitting on a wooden armchair outside. She says, in a mix of English and Malay: "Maybe later, I will cook. Sometimes it is chicken, sometimes fish with some spices." A few doors away, her childhood friend, Ms Sng Mui Hong, calls out to a golden-coloured stray cat. "Niao gong," she says, referring to the male feline. It is feeding time. Ms Sng, 65, is known as the kampung's "towkay". Her father, a traditional Chinese medicine seller, had bought the 1.22ha land in 1956, renting it out to families. When he died in 1997, he passed it down to her and her three siblings. Her siblings have moved to Housing Board flats. She collects rent from the 26 families still living on the private land, which is about the size of three football fields. With six big dogs in her home - mostly strays that she had adopted - it would be impossible for her to keep the cat indoors, she says. At about 8.30am, she is seen waving to housewife Lina, 47, who is pushing a trolley of groceries down the dirt path, while two of her dogs run free in the garden. Madam Lina, who declines to give her full name, has just returned from the recently opened Giant supermarket with her 20-year-old son. Being just 400m away, it takes them only about 15 minutes to walk there. After a short chat in Malay, Madam Lina casually passes a $10 bill to Ms Sng over her gate and receives a blue handwritten receipt. Her monthly rent is $9.10, but she does not fuss over the change. She says: "Mui Hong will sometimes come to our door to collect (the rent), or we will just give it to her if we see her. Our system is very simple; we trust each other." She is about to drift into slumber when a smattering of voices outside her house breaks the lull. Gently pushing her wooden front door ajar, the 85-year-old great-grandmother finds herself peering at a 62-year-old man, who identifies himself as Mr Low, and his three-year-old grandson Jaylen. Her brows are furrowed in displeasure. Mr Low apologises profusely. He wanted to take a break under the shade of her porch, he explains. The tanned, lanky man had ridden his e-scooter from Punggol to Kampung Lorong Buangkok, and the scorching heat is too much to bear. The elderly woman, whose ash-grey hair is pulled back into a bun, softens her glance. Using a walker, she potters out and takes a seat on a bench on the porch. The pair exchange a few basic Malay words, and before long, the complete strangers are talking animatedly about their families. In the afternoon, a different kind of commotion unfolds. Throngs of curious visitors - from families to students - stream in. My sons know how a kampung looks like... But they've not had the chance to walk through one. It is a part of Singapore's history, and this is a way for them to experience it. Among them are 10 secondary school students who make an entrance on their yellow ofo bicycles. Is this place haunted, a boy wonders aloud. His friends brush him off. It's bright daylight now, they chide. Such visits have become a routine affair for the kampung dwellers, who are generally welcoming to strangers, as long as they do not cast prying eyes into the private spaces of their homes. Many visitors, like polytechnic lecturer Aubrey Koh, 39, and his wife, enthusiastically snap photographs using their mobile phones. Mr Koh is visiting with his two sons, aged 10 and seven, after a family lunch. "My sons know how a kampung looks like, as we drive to Malaysia often. But they've not had the chance to walk through one." He adds: "It is a part of Singapore's history, and this is a way for them to experience it. But they get restless quite fast, with all the mosquitoes, bugs and the heat." Many foreign tourists also find their way to the kampung, including 70-year-old retiree Jurgen Gaude from Germany, together with his wife and sister-in-law. His daughter, who works in Singapore, had urged him to visit the kampung "before it is all gone". She had scribbled the directions by public transport on a piece of paper. But they still got lost, he jokes. "I'm glad we made it here. I like it, it feels romantic," Mr Gaude says. At about 3.45pm, Mr Seah Yong Choi, 55, returns home from work at a biscuit factory. 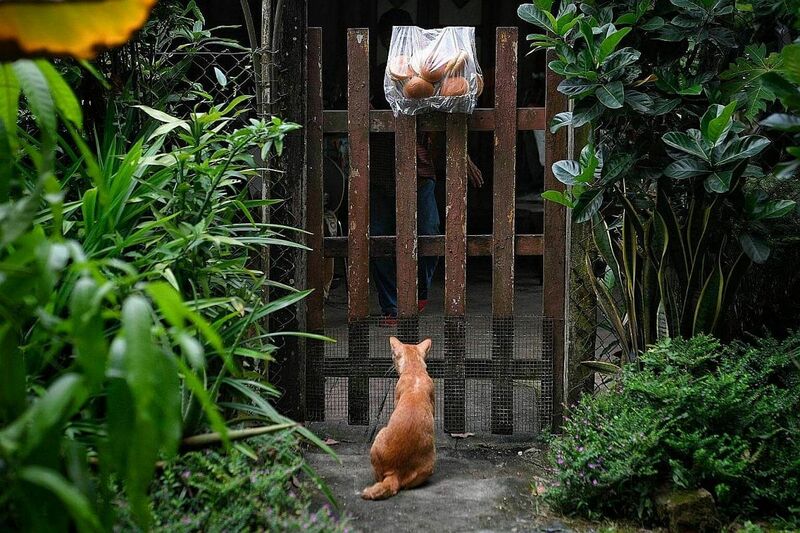 He holds a plastic bag filled with hamburger buns, strolls up to Ms Sng Mui Hong's house and hangs the bag on the gate - a little token for the kampung's "towkay" and landlord. He says: "My friend gave a lot of bags to me and I can't finish the food anyway. We like to share food among neighbours; it's not a big deal. " Minutes later, old Hokkien songs blare from his neighbour's house, matched with punchy drumbeats. The drumming is not from the radio, however - it is "party king" Ong Chin Hock, 57, playing his hand-me-down drum set. He picked up the skill by watching YouTube videos, he says. He also likes inviting people over to sing karaoke, hence his nickname. With a sheepish look, he adds: "I would give myself only 50 out of 100 marks. I'm not good at it, I just play (the drums) for fun." About three times a week, at about 5pm, postman Mohd Izri Yatiman, 29, does a quick round at Kampung Lorong Buangkok, deftly manoeuvring his motorbike from house to house. The kampung is usually the last stop on his delivery route, which starts at 7am and takes him to parts of Serangoon and Hougang. Most of the residents have their addresses painted on their letterboxes or front gate, but some letterboxes are tucked in nooks and can easily be overlooked. But after four years of delivering to the area, Mr Mohd Izri has learnt his way around. And for residents who do not have a letterbox, he knows to leave their mail at the front of their doors or with a neighbour. In 10 minutes, his job is done. The Malaysian, who lives in Johor Baru, says: "It is fun and interesting to see a kampung in Singapore." A while later, the grey clouds that have been looming overhead since the late afternoon open up. Rain pelts down on rooftops, chasing the residents indoors. But for Ms Annie Ridwan, 67, her home of about 50 years is no longer a refuge on rainy days, but an annoyance. Her father had built the house and she has lived there most of her life with her eight siblings. Now, she is alone. Often, the rain seeps through the roof and into her living room, toilet and bedroom. She has to collect the rainwater with pails, she laments. Ms Annie, who works as a cleaner and earns about $45 a day, says fixing the roof is not a priority. The widow, who does not have children, says her late husband and relatives have tried to fix it but the problem keeps coming back. "The house is very old already," she adds. "I don't know what to do. Other people go under their blankets when it is raining, but for me, I open up my umbrella, sit in the living room and wait." When the rain stops at about 6pm, she heads out to meet her friends for dinner at a Hougang Green coffee shop. At her gate, she throws seven large empty egg cartons onto the ground, where several puddles have formed. "I saw (a video) on Facebook that said that when (the cartons) dry up, it will be like cement and it can flatten the ground," she explains. Close to 7pm, a handful of people turn up at the kampung's surau (prayer hall) - a simple zinc-roofed house - for the Muslim evening prayers. In the 1960s, a few villagers had banded together to build Surau Al-Firdaus for the large number of Malay families there. 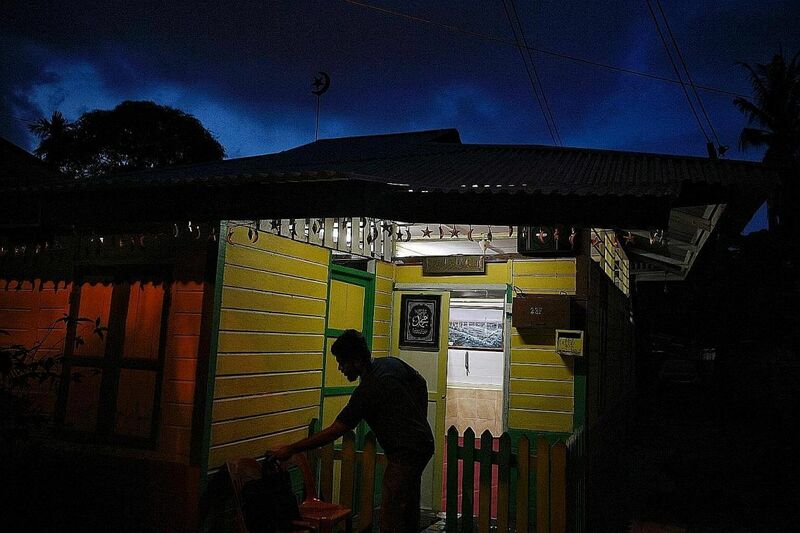 Today, many of the surau's regulars are not residents of the kampung, such as Grab driver Johari Suhaimi, 39, who fondly recalls his life in a kampung on Pulau Ubin. He moved to the mainland in 1991 and now lives in Punggol. He says: "If I am nearby, I like to come here to pray. It is so close to nature. It gives me a sense of peace." The origins of Kampung Lorong Buangkok can be traced back to 1956, when traditional Chinese medicine seller Sng Tow Koon acquired a 1.22ha plot of swampy land near present-day Gerald Drive, off Yio Chu Kang Road. He leased pockets of the land - about the size of three football fields - to Malay and Chinese families for them to build their houses. Over time, a kampung, or village, developed. At its peak, the kampung housed a total of 40 families, many of whom worked at the nearby Woodbridge Hospital or factories. Today, there are reportedly 26 households remaining. The land was passed down to his children. The landlord today is his daughter, Ms Sng Mui Hong, 65. Ms Sng leases out parcels of the space for between $6.50 and $30 a month. The kampung, which is on private land, is not a conserved site. 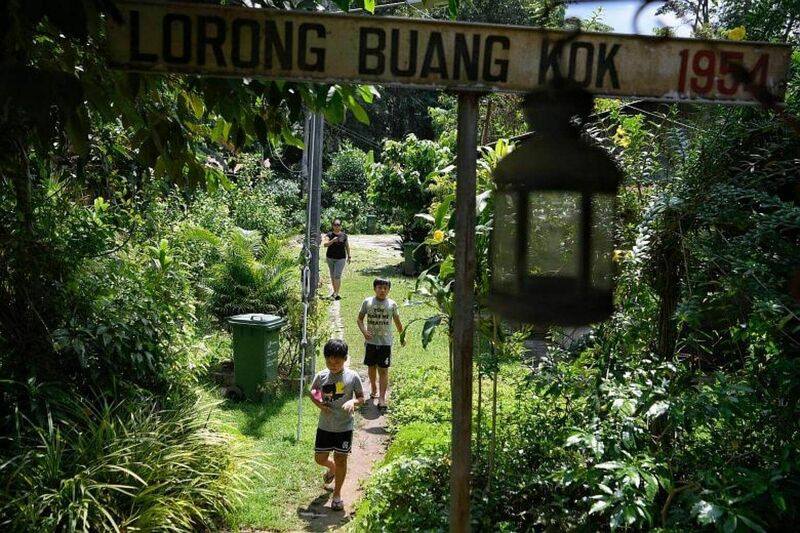 In Parliament last Tuesday, MP for Ang Mo Kio GRC Intan Azura Mokhtar called on the Government to preserve Kampung Lorong Buangkok as a conservation site or heritage education site. Located in Ms Intan's Jalan Kayu ward, the site has been slated to make way for a major road and two schools in the future. "Surely we can explore ways where the kampung can coexist (with) and, in fact, enhance and bring value to urban life," she said in Parliament. It could be integrated within the two schools planned and play a role as a "community living lab" where students can learn about the country's shared history, culture and traditions , she added. Many of the people who are now living at the kampung are elderly folk. They are used to curious visitors who want to catch a glimpse of the place before it disappears. Still, privacy remains important. All the households declined The Sunday Times' request for an overnight stay. "You can ask around all you want, but I think you won't have any luck," said Ms Sng last Wednesday night, with a laugh. 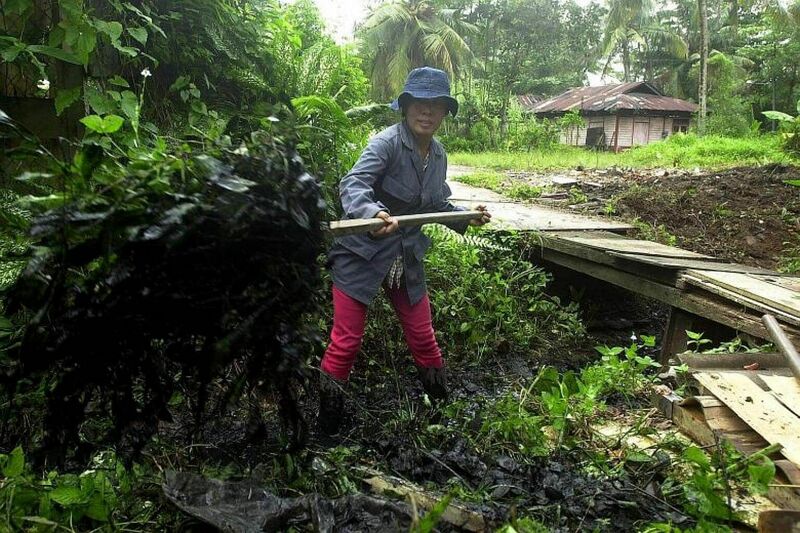 The kampung is also known as Selak Kain, which meant "hitching up one's skirt" as people used to hitch their skirts up to wade through floods whenever there were flash floods in the 20th century. Kampung Buangkok's postal code was 1954, when Singapore still used only four digits for postal codes before Sept 1, 1995. It has since been changed to a six-digit postal code, but an old sign found there bearing the old code remains as a nostalgic reminder.